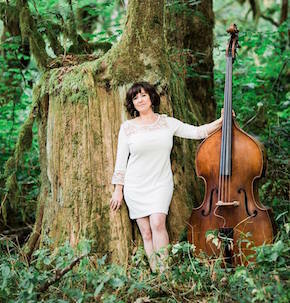 JUNO nominated bassist, composer, bandleader and educator Jodi Proznick has earned a reputation as one of Canada’s finest jazz artists. She was the winner of numerous National Jazz Awards including Bassist of the Year in 2008 and 2009. Her group The Jodi Proznick Quartet was awarded the Acoustic Group of the Year and Album of the Year in 2008 and the ‘Galaxie Rising Star’ of the Vancouver International Jazz Festival in 2000. She co-produced her JUNO nominated debut album, Foundations, in 2006 and the JUNO nominated Jaclyn Guillou album, This Bitter Earth, in 2016. In addition to leading her own group, Jodi has performed with many of Canada’s top jazz musicians and has been featured on over 30 recordings as a sideperson. Other awards include the General Motors Award of Excellence at Musicfest Canada 1993, a performance scholarship to study bass at McGill University in Montreal and the IAJE Sisters in Jazz award in 1998 as one of the best up and coming female jazz musicians. Her latest release Sun Songs was named as one of the top 10 jazz albums of 2017 by the Ottawa Citizen and was featured in a full-page article in Downbeat Magazine in February 2018. Jodi Proznick’s new album, 2017’s Sun Songs, invites the listener into a joyful musical experience that celebrates the cycle of life. Jodi Proznick’s new album Sun Songs invites the listener into a musical experience that explores the depths of and reverence for the dualities of life. This project is a new venture for Jodi as a composer, bassist, producer, and songwriter, who soon after her album Foundations was nominated for a Juno Award, was faced with two sets of emotionally charged news: first, the immense joy of discovering she was expecting a baby and would enter the brave new world of motherhood, and second the intense sorrow of learning that her mother was diagnosed with early onset dementia. The title for Sun Songs is a play on words. First, it’s a dedication to her son, and second, the metaphor of life as sunrise and sunset. As if she was standing on the horizon watching two suns simultaneously rise and fall, both lighting up the sky in different ways. These are the polarities explored through each song: birth, death, the learning and unlearning of life, and the emotions that arise in its quieter moments. Jodi found herself documenting words, images, and melodies to help process the titanic emotions transpiring through her as the story unfolded. A collection of songs emerged, eight originals and one cover, in a narrative documenting the process of containing these dramatic dualities and emerging more resilient and in tune with the pendulum of life. In the land where jazz and pop meet, two genres that have always been intrinsically woven together, Sun Songs becomes the template for a new weave. Every track is an exquisite tapestry of modern harmonies and rhythms, layered with memorable melodies and potent lyrics. Featuring her prodigious quartet of Tilden Webb (piano), Jesse Cahill (drums), and Steve Kaldestad (tenor saxophone), Jodi shines an even brighter light on this album with the addition of singer Laila Biali, whose luminous vocals lift the songs to unparalleled heights. A stalwart on the Vancouver jazz scene as a performer and educator, Jodi Proznick is undoubtedly the perfect person to bring this work to light. Infinitely talented as a songwriter, producer, and player, she is also a mentor for the next generation of jazz musicians. Sun Songs represents the unbridled potential of every woman’s most powerful contribution to her story. In fact, the album may become a beacon for other artists aspiring to share their own stories with the world. Inside each song, a radiant beauty echoes, and there’s a gateway to the many different ways we can all light up the sky. "A Wonderful bassist who really digs in and plays from the heart"
"...Bassist/composer Jodi Proznick is a gifted young musician whose star is definitely on the rise. Although she plays regularly in a number of groups, the totality of her gifts come to light as a leader. Her quartet is fresh, intense, and highly interactive, featuring some of the finest young musicians in the country." "A jazz bassist with great time and a rock-solid sound is worth her weight in gold, and Jodi Proznick IS that lady!" "Proznick has a sense of confidence about her that makes her musical partners play to the best of their abilities. It is Jodi's stage presence however that separates her from many a musician. If you haven't had the pleasure of seeing Proznick perform live, you have to... you always leave the show with a smile on your face."